Image courtesy of the SC Conference Series. Between November 11th and 16th, the Kay Bailey Hutchison Convention Center Dallas will be hosting the SC18 – The International Conference for High Performance Computing, Networking and Storage. The event hosts a variety of presentations, workshops, exhibitions, and demonstrations related to the latest technological advancements on high-performance computing, networking, storage, and analysis. The SC Conference is an annual event that was established in 1988 by the IEEE Computer Society and the ACM SIGGRAPH organizations. This conference attracts brilliant minds from all over the world. At this year’s event, there will be more than 11,000 attendees, including scientists, researches, developers, computing center staff, and many more. On the trade show floor there will be over 375 exhibitors, including industry vendors, research organizations, universities, and government agencies. You can find the full list of exhibitors here. So why am I writing about the SC Conference? I am happy to announce that NetBeez is a Bronze contributor of SCinet, the SC Conference’s dedicated high-capacity network infrastructure. NetBeez donated several GigE, WiFi, and virtual monitoring agents to monitor SCinet. In October, the hardware units were delivered to the SCinet staff in preparation for the event. If you are a regular reader of our blog, you probably already know that this is not the first time that NetBeez sensors have been deployed on a trade show network to monitor the end-user experience (read more about InteropNet, IETF, ACM Siggraph, and Cisco Live). However, given the nature of SCinet, this time is different! To quote the SC18 website, SCinet is the SC Conference’s dedicated high-capacity network infrastructure, designed and built by volunteer experts from industry, academia, and government. Planning begins more than a year in advance of each SC conference and culminates in a high-intensity installation that, for the duration of the conference, is the fastest and most powerful network in the world. If you love networks as we do at NetBeez, you’ll share our excitement. To give you more information about SCinet, I have interviewed Ken Miller, the SCinet DevOps co-lead, who focuses on network measurement, monitoring, and performance of SCinet, as well as additional IT services at the conference. 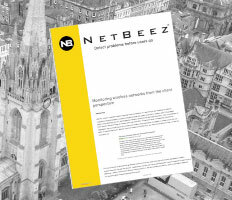 Ken requested to have NetBeez co-staged with other contributors to collect network performance statistics. What is the SC Conference about? Miller: SC is the International Conference for High Performance Computing, Networking, Storage, and Analysis. How did you learn about the SC Conference, and when did you first attended it? Miller: I learned about the conference and SCinet from another research and education network peer. I first attended in Salt Lake City at SC12 as part of the measurement team. Can you tell us a little about the trade show network? 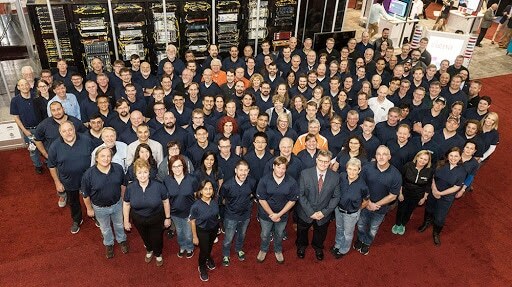 Miller: SCinet is a group of approximately 200 volunteers designing, building and operating the network for the conference and exhibit hall with hardware and software donations from 40 contributing organizations. This year we will be delivering 4.02 Terabits of wide area network bandwidth for SC18. The network can deliver even more bandwidth on the exhibit floor for network research exhibitions as well as other booth demos. The Innovating the Network for Data-Intensive Science (INDIS) workshop brings together network engineers and researchers to share challenges and potential solutions in the information systems and networking communities. In addition, there is a SCinet diversity program, “Women in IT Networking at SC” (WINS), as well as participation by student volunteers. What type of technologies will be demoed there? Miller: The demos and major announcements of new technologies take place during the show. I recommend following the SC Conference’s social media posts to learn more. Any interesting fact or finding? Miller: This year marks the 30th anniversary of the SC Conference. There will be a historical perspective on that as well as a booth on the anniversary celebration that DevOps is helping with. SCinet ran a mile of fiber to make this conference possible at the speeds needed. To conclude, if you are interested in all things network speed and performance, the SC Conference is a must-attend event. Registrations to SC18 are still open for attendees — the last day to pre-register is November 9. If you are unable to attend SC18, you can join this annual conference next year. You can also submit your application to volunteer with the SCinet staff and help the team build the fastest temporary network in the world. If you are attending SC18, connect with me on Twitter or LinkedIn so we can meet at the trade show and chat more about all things supercomputing. If not, share your thoughts with me in the comments below.